A generation of contemporary Glasgow based artists, all loosely associated with ‘neo-conceptualism’, who include Turner Prize winner Douglas Gordon, Roderick Buchanan, Jacqueline Donachie, Nathan Coley, Ross Sinclair, David Shrigley and Tracy Mackenna, are increasingly turning to the book as a medium for their art. 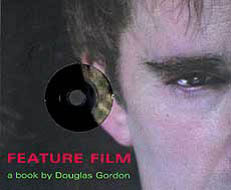 Gordon’s book, Feature Film, complete with CD featuring Bernard Herrman’s score for Hitchcock’s classic Vertigo published by Bookworks and Art Angel has already almost sold out a print run of 2500 copies, proving that artist publications can break through into the popular market. These young Glasgow artists work primarily in film and video. The process of book making and the tradition of the book form is not in itself their primary concern. As lens-based artists they tend towards images of physical immediacy or emotional intensity, often drawn from personal experience. In Feature Film, the reader – one wants to say viewer – comes suffocatingly close to the orchestra’s conductor James Conlon; close enough to see the hairs on his wrist and trickles of sweat, creating a sense of suffocating intensity. This mood recalls the film, which, although it is absent, is also suggested in the way that the book unfolds frame by frame, following the sweep of Conlon’s dramatic gestures, creating a rhythmic undercurrent to the music which is both literally and imaginatively wrapped within the covers. In this respect it recalls Joao Penalva’s beautiful 336 Pek (recently published by Camden Arts Centre), in which the text is laid out in units divided by the timings of the video it derives from. Artists seem increasingly to be turning to these popular structural approaches, and combining them with the traditional codex form. New technologies are changing the ways that we read and write, as surely as the camera lens has altered the world we see. Like much of Gordon’s work, Feature Film explores the external reality of performance, the skin of things, and reveals internal anxieties; folding in high and popular art forms. Helen Douglas of Webproductions, has, since the early 1970s, worked solely in the medium of the book. She and Telfer Stokes, with whom she has worked collaboratively on many books, have been primarily artist-printers. Their art is often made using photographs, but it defines itself in relation to the book form, and to the creative possibilities of printing. 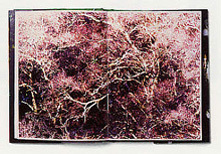 Douglas’s most recent book, Wild Wood (1999), presents a series of colour photographs taken over a six month period in woodland near her home in the Yarrow valley. This glen is strongly associated with the Border Ballads, and she captures much of their spell. Combining intense colour sensations through a carefully crafted discontinuous sense of place (achieved by framing each page with a thin edge taken from another image), this book is the first she has made primarily through new technology. Although the computer differs in some crucial respects from the printing press, the success of this book makes it clear that her creativity is as inspired by these newer technologies as it was by the older forms of lithography. Wild Wood is a joyful riot of tangled undergrowths and shape-shifting branches; a woman’s eye, loving, intense, cast. Like Gordon’s it combines narrative structures which inhere in old and new technologies, and, like his book, it is capable, with the right distribution, of reaching the modern equivalent of Virginia Woolf’s ‘common reader’, someone who is willing to suspend conventions of book genre and enter an intense reading and viewing experience, someone who is willing to step into the wild wood. The Centre for Artist Books at Dundee Contemporary Arts reflects the growing interest in this area of artistic practice. Alec Finlay is co-ordinator of the Centre for Artist Books. He is an artist and publishes under his imprint, Morning Star. Feature Film, Douglas Gordon, Bookworks, in association with Art Angel. PBK, colour, £22.95. Wild Wood, Helen Douglas. Webproductions. HBK, colour. £20.00. Available from Webproductions, Deuchar Mill, Yarrow, Selkirk TD7 5LA.